Charleston Academy, Inverness with the closed off third floor in darkness last night. Picture by Sandy McCook. Asbestos has been found at one of the largest schools in the Highlands – sparking renewed calls for the local authority to “sort out its neglected school estate”. 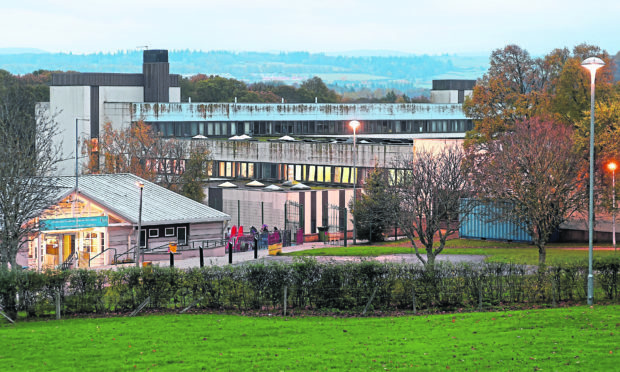 The entire upper floor of 725-pupil Charleston Academy in Inverness has been shut off following the shock discovery in the ageing building’s science labs. The 40-year-old school remains open, however, and council leaders say they are confident measures are in place to safeguard pupils while specialist work is carried out. Experts will carry out further “reassurance” tests today in the hope of reopening the school tomorrow. But the discovery has prompted alarm among politicians over the condition of the region’s schools, including SNP group leader on Highland Council Maxine Smith and MSP Kate Forbes, whose constituency includes the catchment area for students from the Beauly Firth area. Mrs Smith said: “I call on the council to address its neglected school estate by looking at more affordable designs. “It’s shameful to see Highland schools in this state. The ruling Administration must listen to the suggestions from the SNP Group to design modern frameworks for ‘off the shelf’ schools and consider modular builds. “The latter two models would avoid the excessive costs of each high school coming in around £30 million. Kate Forbes MSP has criticised the Highland Council for having “the worst school estate in Scotland” despite figures revealing the local authority has received the second largest sum of funding across Scotland from the Scottish Government. But council leader Margaret Davidson says they are “spending as much as they can” on schools and have asked for more funding. A Highland Council spokeswoman said: “Precautionary measures were taken last week in the school’s science department to temporarily vacate staff and pupils from the department. “This action was taken following planned works in the school during the holidays and on return to the school concerns were raised about dust found in the science rooms. “The school is working closely with council officers and are acting on their advice. She added: “Additional tests for asbestos have been carried out and have come back as a negative result. “Additional general repair work has also now been completed and further reassurance tests will be conducted tomorrow (Wed) and we anticipate full access to the rooms from Thursday this week. Local councillor Alex Graham said: “There is obviously concern with buildings of this age. Asbestos was widely used in all types of buildings in the 60s and 70s. More than 200 asbestos hotspots were found during inspections of a Ross-shire academy – described as the north’s worst school building. A Highland Council report revealed earlier this year the extent of the problem at Alness Academy. The local authority has plans to build a new £30million “cleaner and greener” school. Meanwhile the kitchen at Broadford Academy in Skye had to be closed following concerns about asbestos in fragments of coating that fell from the ceiling of the room. The discovery sparked renewed calls for a new building to replace the school, which was built in 1975 and has been plagued with problems in recent years. Highland Council has the largest number of schools in Scotland, at 204. Twelve of the schools included are currently exceeding 100% capacity, with a further 21 expected reach capacity in the next five years. The Scottish Government school estates report for 2017 revealed the region possessed the highest proportion of schools categorised under the poor category for both primary – 67 – and secondary – 12. The region also had the third highest number of satisfactory schools, behind only Aberdeenshire and Fife.